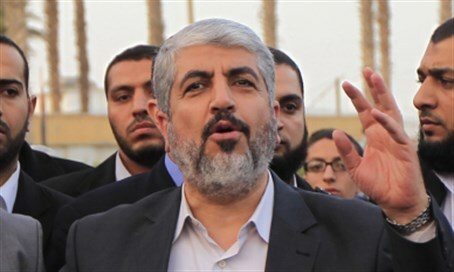 Head of a Hamas-affiliated institution claims Tony Blair invited Hamas leader Khaled Mashaal to London to discuss truce with Israel. Azzam Tamimi, formerly the head of the Institute of Islamic Political Thought in London, which is considered to be affiliated with Hamas leader Khaled Mashaal, claimed on Wednesday that former British Prime Minister Tony Blair invited Mashaal to London to hold talks about the truce agreement with Israel. In an interview with the Hamas-affiliated Al-Risala newspaper, Tamimi said that the visit did not take place because Hamas demanded to find out the details of the proposal in advance, and opposed the idea that the talks would be a continuation of the Oslo process or an attempt to revive peace talks with Israel. Tamimi further claimed that Blair received the approval of British Prime Minister David Cameron for Mashaal’s visit, and that Hamas has an interest in the visit taking place, regardless of its outcome, since it shows the EU’s willingness to break its “siege” on Hamas in preparation for its removal from its blacklist of terrorist organizations. He said that European officials have a keen interest in reaching a peaceful agreement, which includes the gradual removal of the blockade on Gaza, adding that the success of a move in Gaza may prepare the ground for a unilateral Israeli withdrawal from Judea and Samaria. Tamimi’s comments come amid continued reports that Hamas has been holding secret talks with Israel aimed at reaching an eight- or 10-year truce, with Israel removing its blockade on Gaza. Israel on Monday denied it was engaged in "any meetings with Hamas, neither directly, nor via other countries or intermediaries". The PA, however, has been up in arms over the reports. On Sunday, the Fatah faction which heads the PA called the talks an attempt to bypass the "legitimate" rule of the Palestine Liberation Organization (PLO) and of PA chairman Mahmoud Abbas. On Tuesday, the PA’s foreign minister, Riad al-Malki, claimed there were talks between Israel and Hamas that would cause Palestinian disunity.